The Martini GTX is a decked, take-apart, touring kayak with a roomy and comfortable cockpit to explore with and then take back home in the back of your car. Like the sit- on-top version, the Martini GTX features the innovative patented Snap-Tap solution. Created by award-winning design engineer Magnus de Brito, the Martini is a fun, versatile and high-performance recreational kayak. Performance kayaking - Easy to handle in and out of the water. With Point 65´s innovative Snap-Tap system, the single-seater snaps apart and re-assembles in seconds for a kayak that is comfortable, stable, and strong making it by far the most easy to carry recreational kayak on the market.The Martini GTX is a rigid high-performance kayak that you can carry with a smile on your face and which will fit in the back of most cars. It will also fit comfortably in SUV, crossover and mini vans with plenty of room to spare. - Snap in the mid-section and your single seater Solo transforms into a high-performance Tandem. Never before has a kayak been so much fun and so easy to own. In fact, the only thing you’ll need to worry about is deciding whom to bring. By adding mid sections you create the perfect team building tool for as many paddlers as you want. - The Martini GTX is designed with both kids and adults in mind. 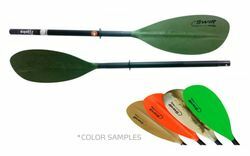 Whether paddling, fishing or just relaxing, this comfortable, stable and strong high-performance kayak is the ideal choice for family fun on the water. - Carrying and hauling, going Solo or Tandem - the Martini has the innovative features to keep everyone smiling. So easy to set up and go, you’ll be having a blast right off the beach. The Martini GTX is equipped with an ex- tremely comfortable AIR seat. The AIR seat, with a pneumatically adjustable backrest, gives the paddler an extremely comfortable and perfectly adjustable seating position. The seat covers are made of highly durable and comfortable, honey-comb patterned material in combination with mesh-like fabric which is laminated and molded over EVA foam. It is equipped with an ergonomically designed seat, backrest and foot braces, which provide for good leg support and a comfortable paddling position. Add the fitted spray cover and you can enjoy a dry ride even in rough conditions. - The Martini GTX features a comfortable ergonomical seat equipped with a cushy seat pad as well as thight braces for improved control, multiple cup holders, integrated rudder and easily adjustable rudder pedals. The Martini GTX also features a large, oval dry-hatch aft and a smaller round bow dry-hatch to access two water tight compartments for safe storage of gear on your next adventure. - Designed for comfort and stability, the Point 65 Martini GTX is a nimble, highly maneuverable decked recreational touring kayak with plenty of legroom. And whether you paddle the Martini! 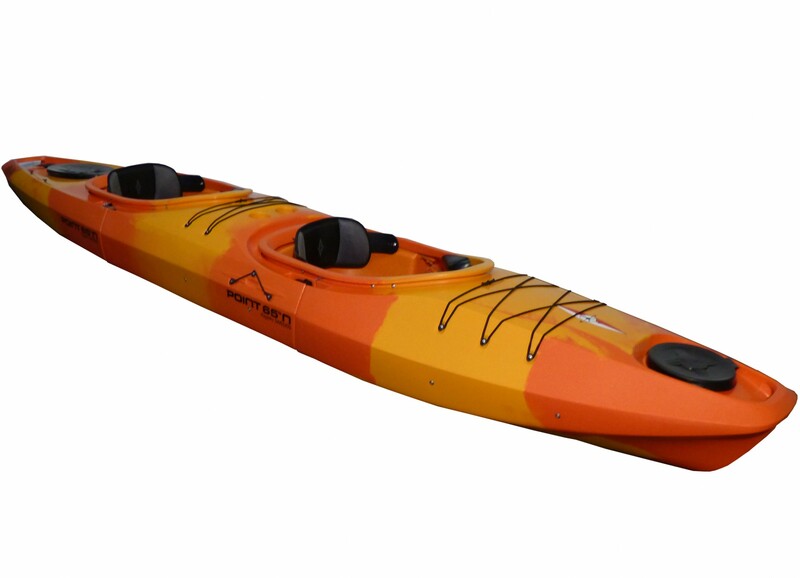 as a Solo or Tandem, this is one of the faster recreational kayaks on the market. Designed for optimal comfort, stability, maneuverability and tracking. It’s perfect for a day of fun or weekend of adventure. Use a protective spray skirt to cover the cockpit and you can paddle the Martini GTX through rough water and stay dry. Load it up — the Martini GTX has tons of dry storage! - The Martini GTX is prepared to accomodate after market fishing equipment and its multiple paddleparks frees your hand to handle all the fishing you need. The molded in fish-o-meter helps in measuring your catch. Going by yourself or with a friend? You have both options in one kayak — just add the Snap Tap mid-section and go from Solo to Tandem in seconds. With a second mid section between the two paddlers you can create additional storage space for your four legged friend and tons of additional gear. Rating for "Point65 Martini Tandem "